TLJ Daily E-Mail Alert No. 2,332, Thursday, January 19, 2012. Thursday, January 19, 2012, Alert No. 2,332. Sen. Reid (at right) wrote that "There is no reason that the legitimate issues raised by many about this bill cannot be resolved. Counterfeiting and piracy cost the American economy billions of dollars and thousands of jobs each year, with the movie industry alone supporting over 2.2 million jobs. We must take action to stop these illegal practices. We live in a country where people rightfully expect to be fairly compensated for a day's work, whether that person is a miner in the high desert of Nevada, an independent band in New York City, or a union worker on the back lots of a California movie studio." He added that "I admire the work that Chairman Leahy has put into this bill. I encourage him to continue engaging with all stakeholders to forge a balance between protecting Americans’ intellectual property, and maintaining openness and innovation on the internet. We made good progress through the discussions we’ve held in recent days, and I am optimistic that we can reach a compromise in the coming weeks." Sen. Reid does not make a practice of bringing bills to the floor, and consuming Senate time, when he does not expect the bill to pass, unless there is some broader political and partisan strategy involved, which is not the case with the PROTECT IP Act. Moreover, there are many other bills whose proponents are competing for Senate floor time in the next few months. This may include several cyber security bills, and a spectrum bill. While Sen. Reid also stated that "I am optimistic that we can reach a compromise in the coming weeks", the Congress may not pass a rogue web sites bill for some time. The primary activities of some of the internet and technology companies that oppose these bills are a Congressional lobbying campaign directed at obstruction and delay, and a grass roots lobbying campaign built on dissemination of hyperbole and disinformation. These companies are not seeking the sort of engagement and discussion that would produce consensus legislation. Moreover, with a Presidential election that may replace the administration, and Congressional elections that may switch party control in the Senate, less than 10 months away, there is little time left to produce new legislation. Opponents are keenly aware of, and base their strategy upon, this schedule. If President Obama were to lose in November, then there would be further delay in addressing rogue web sites as the new administration fills positions, seeks Senate confirmations, and comes up to speed with the issues involved in this legislation. Furthermore, there is the possibility that there will be many new Senators, new Committee Chairmen, and new staff, in the 113th Congress, which would also have a delaying effect. As a consequence, content companies and their allies in the Congress may soon be faced with targeting their efforts towards enactment of a rogue web sites bill in late 2013, or 2014. 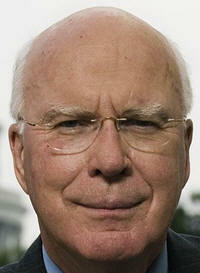 Sen. Leahy (at right) is upset with the course of recent events. He first introduced a rogue web sites bill in late 2010. The SJC reported a bill in the 111th, and a revised bill in the current Congress, over seven months ago. He wrote in a release that "Somewhere in China today, in Russia today, and in many other countries that do not respect American intellectual property, criminals who do nothing but peddle in counterfeit products and stolen American content are smugly watching how the United States Senate decided it was not even worth debating how to stop the overseas criminals from draining our economy." "In the meantime," said Sen. Leahy, "more time will pass with jobs lost and economies hurt by foreign criminals who are stealing American intellectual property, and selling it back to American consumers." He concluded that "I remain committed to addressing this problem; I hope other members of Congress won't simply stand on hollow promises to find a way to eliminate online theft by foreign rogue websites, and will instead work with me to send a bill to the President's desk this year." Rep. Smith, sponsor of HR 3261 [LOC | WW], the "Stop Online Piracy Act" or "SOPA", stated in a release that "It is clear that we need to revisit the approach on how best to address the problem of foreign thieves that steal and sell American inventions and products". He also said that the HJC "will continue work with copyright owners, Internet companies, financial institutions to develop proposals that combat online piracy and protect America’s intellectual property. We welcome input from all organizations and individuals who have an honest difference of opinion about how best to address this widespread problem. The Committee remains committed to finding a solution to the problem of online piracy that protects American intellectual property and innovation." Rep. Darrell Issa (R-CA) stated in a release on January 20 that "Postponing the Senate vote on PIPA removes the imminent threat to the Internet, but it's not over yet. Copyright infringement remains a serious problem and any solution must be targeted, effective, and consistent with how the Internet works." He also touted his bill, HR 3782 [LOC | WW], the "Online Protection & Enforcement of Digital Trade Act", or "OPEN Act". See, story titled "Rep. Issa Introduces Alternative to SOPA" and "Comparison of the Key Processes of SOPA and OPEN Act" in TLJ Daily E-Mail Alert No. 2,331, January 18, 2012. Rep. Issa added that "It is clear that Congress needs to have more discussion and education about the workings of the Internet before it moves forward on sweeping legislation to address intellectual property theft on the Internet. I look forward to working with my colleagues and stakeholders to achieve a needed consensus about the way forward." The House will meet at 12:00 NOON for morning hour, and at 2:00 PM for legislative business. Votes will be postponed until 6:30 PM. No technology related items on are the agenda. See, Rep. Cantor's schedule for the week. The House will meet 10:00 AM for morning hour, and at 12:00 NOON for legislative business. No technology related items on are the agenda. See, Rep. Cantor's schedule for the week. 9:30 - 10:30 AM. The Information Technology and Innovation Foundation (ITIF) will host a discussion of the book [Amazon] titled "Restoring the Innovation Edge". The speakers will include the author, Jerald Hage (University of Maryland). See, notice. Location: ITIF/ITIC, Suite 610A, 1101 K Street, NW. 10:00 AM. Day one of a two day mark up session of the House Judiciary Committee (HJC). The agenda does not include either HR 3261 [LOC | WW], the "Stop Online Piracy Act" or "SOPA", or HR 3782 [LOC | WW], the "Online Protection & Enforcement of Digital Trade Act" or "OPEN Act". Location: Room 2141, Rayburn Building. The House will meet at 9:00 AM for morning business. No technology related items on are the agenda. See, Rep. Cantor's schedule for the week. Day one of a three day event titled "House Democratic Issues Conference". 10:00 AM. Day one of a two day mark up session of the House Judiciary Committee (HJC). Location: Room 2141, Rayburn Building. 10:00 AM. The House Homeland Security Committee's (HHSC) Subcommittee on Oversight, Investigations and Management will hold a hearing titled "Is DHS Effectively Implementing a Strategy to Counter Emerging Threats?". See, notice. Location: Room 311, Cannon Building. 12:15 - 1:30 PM. The Federal Communications Bar Association's (FCBA) Homeland Security and Emergency Communications and State and Local Practice Committees will host a brown bag lunch titled "Emergency Communications Policy Issues in the National Capitol Region". The speakers will be interoperability coordinators for the national capital region (NCR), Michele Farquhar (Hogan Lovells), Chris Essid (Director of the DHS's Office of Emergency Communications (OEC), and Trey Forgety (National Emergency Number Association). For entry upon arrival, call Alex Kreilein (DHS/OEC) at 202-603-8702. Location: Bureau of Alcohol, Tobacco, and Firearms, Room 3200, 650 Massachusetts Ave., NW. 5:00 - 7:00 PM. The Net Caucus will host an event titled "15th Annual Kickoff Tech Policy Exhibition & Reception". Free. Open to the public. Location: Room 902, Hart Building. Day two of a three day event titled "House Democratic Issues Conference". 10:00 AM. The Senate Judiciary Committee (SJC) will hold an executive business meeting. The agenda includes consideration of the nomination of Paul Watford to be a Judge of the U.S. Court of Appeals (9thCir). The SJC will webcast this event. See, notice. Location: Room 226, Dirksen Building. The Senate Judiciary Committee (SJC) will hold a hearing on the nominations of Andrew Hurwitz (to be a Judge of the U.S. Court of Appeals (9thCir)), Kristine Baker (USDC/EDArk), John Lee (USDC/NDIll), John Tharp (USDC/NDIll), and George Russell (USDC/DMd). The SJC will webcast this event. See, notice. Location: Room 226, Dirksen Building. Day three of a three day event titled "House Democratic Issues Conference". Deadline to submit comments to the Securities and Exchange Commission's (SEC) Advisory Committee on Small and Emerging Companies in advance of its February 1, 2012, meeting. See, notice in the Federal Register, Vol. 77, No. 9, Friday, January 13, 2012, at Page 2102.